PTFE O-Ring is a mechanical product that is used as a joint that helps the machine work without any external disturbances. We manufacture these by different process of extrusion, moulding, etc. We supply and export these Rings In different inches and metric sizes. These are used in mechanised machines that fill the purpose of managing stress in the product and how this stress is to be applied on the machine. The company also makes available well-designed PTFE O-Rings. 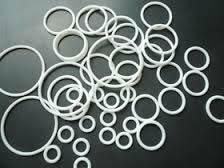 The range of PTFE O-Rings made available by the company is manufactured using quality materials and is hence, low on maintenance requirements. We offer PTFE O-Rings at the best prices in the market. Range : Manufacturing s per customer's specifications and drawings up to 1500 MM Dia.